Members of the Cal Poly Pomona cybersecurity team. 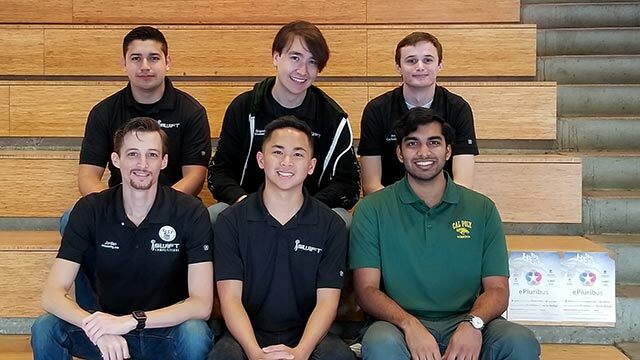 A group of ethical hackers from Cal Poly Pomona are finalists in a top cybersecurity penetration testing competition after finishing second to regional host, Stanford University. They now advance to the national round November 2-4. The Collegiate Penetration Testing Competition invites students to play the role of a technology firm hired to attack a company’s infrastructure to expose potential security flaws. The top two regional finishers move on to the national stage with Stanford, Cal Poly Pomona with the addition of Cal State Fullerton earning a wild card and a chance to represent the west for 2018. Pike tasked captain Brandon Sakamoto with finding students with cybersecurity knowledge, all with an expertise in varying fields. The final roster was comprised of five computer information systems students and a computer science major – Sakamoto, Kevin Ruiz, Joseph Dillon, Jonathan Chua, Jordan Wheeler and Eric Kannampuzha. During the Oct. 5-7 western regional held on the Stanford campus, Pike said the students used industry standard exploitation tools and their knowledge of computer systems to breach a company’s network. Once inside, different members would move in and begin harvesting sensitive data. A cryptography expert was fed encrypted files to decode while others deployed malicious programs. CPTC is sponsored nationally by the Rochester Institute of Technology with the help of grants and corporate support. The upside of a strong showing extends beyond a trophy.